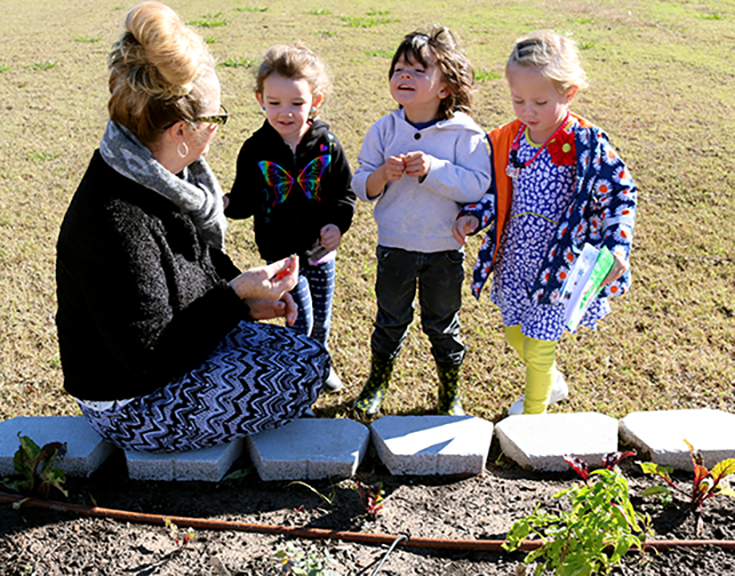 Child Development Center and Lab School teacher Constance Pidgeon shows children from her class the different herbs planted in their community garden. They are (left to right) Liv, 4, Mark, 4, and Lucy, 4, from her preschool class. Pidgeon said the garden, located out back in the play area, is used to teach young children about plants and growing vegetables. Children at the center had help planting the garden Sept. 30, thanks to 14 Heritage Hall high school students, numerous community volunteers and the non-profit organization Oklahoma City Harvest. The goal is to create outdoor classrooms where children can learn about science, math, and nutrition, while also developing gardening skills, said Brittany Earnest, marketing and events manager with OKC Beautiful. Broccoli, brussels sprouts, parsley, sage, rosemary, and kale are just a few of the cool weather vegetables planted in the OCCC Child Development Center’s newly built schoolyard garden. As an added benefit, the garden also provides a peaceful environment for reading to the children, Earnest said. Larry Heyman, co-founder of Oklahoma City Harvest, said he’s gotten positive feedback from participating schools. “Each garden receives four raised rectangle beds, each measuring 4 feet by 12 feet,” Heyman said. Volunteers got started by laying landscape fabric. The next step was to lay the paving stones to outline each bed. Nutrient rich compost soil was rolled in and the drip irrigation system installed. Lastly, the seedlings were planted. Oklahoma City Harvest is a non‐profit educational organization that helps other non-profits and community organizations plan, build, and grow community and neighborhood gardens. “The kids are really excited about it,” Heyman said. “School districts have a lot of land and school yards largely go unused. “We decided that since schools are a great community center and a good community gathering spot for parents, it made sense that we plant schoolyard community gardens. “One of the things we teach the children is that exposing a carrot to freezing temperatures creates a sweeter tasting carrot,” Heyman said. Constance Pidgeon is a child development teacher and lab assistant at the center. “After visiting the schoolyard garden at Emerson Elementary School, we contacted Heyman with Oklahoma City Harvest to build a garden,” Pidgeon said. All the children at the OCCC Child Development Center are involved in the garden, Pidgeon said. The instructors have found that the children who care for the plants have a sense of pride about having grown food, and are more likely to want to eat it. The first Oklahoma City Harvest garden was planted at Roosevelt Middle School in May of 2014. Since then they have planted 14 more gardens, making the OCCC Child Development Center garden number 16. “We build the garden, then hand it over to the school,” Heyman said. With help from volunteers, sponsors and corporate outreach, the gardens can be installed in as little as a day, at no cost to the school. Oklahoma City Harvest provides support and lesson ideas to teachers throughout the year to ensure schools get the maximum benefit. The program also updates the plants as the seasons change. The Center’s garden was dedicated last month. To learn more about community gardens visit www.okcharvest.org. For more information about OCCC’s Child Development Center, call 405-682-7561.